In 1977 Colin Chapman's Lotus team had shocked the world of Formula One with the innovative ground-effect Lotus 78. The design incorporated wing profiles in the sidepods enclosed in venturi tunnels, accelerating the airflow under the car. The increased airflow created a low pressure area underneath the car, which was contained by flexible rubber skirts mounted to the sidepods. The low pressure area created a suction effect, which pushed the car hard into the tarmac. As a result more downforce was exerted on the tires, increasing grip and substantially raising corner speeds. Furthermore, the nature of the design meant virtually no extra drag was created, a disadvantage which was inescapable with conventional large wings. As the car had been built in total secrecy, none of Lotus' competitors had yet realized what Colin Chapman’s firm had done. After a few confident displays of the 78's overpowering speed, rival teams were scrambling to pick up the pieces. Something had to be done to counter the black and gold menace. Mario Andretti and the groundbreaking Lotus 78, 1977 Monaco Grand Prix. A young South African designer by the name of Gordon Murray thought he had it figured out by early 1978. Murray was attached to the mid-field Brabham team owned by one of the sport's leading figures, a certain Bernie Ecclestone. The team had enjoyed numerous success under the ownership of its namesake, double World Champion Sir Jack Brabham. Sadly the illustrious outfit had fallen from grace since then, leading to a slump to mid-field. Desperate to find their way back to the top, Brabham's engineering team started to look for ways to gain a competitive advantage over the rest of the field. By now the dominant Lotus' design principles had become common knowledge, although nobody seemed to know more than the rough outline. Gordon Murray had also found out Lotus had used venturi-tunnels running underneath the car, but was forced to admit Brabham's BT46 was unable to incorporate such a system. Niki Lauda in the lackluster Brabham BT46. 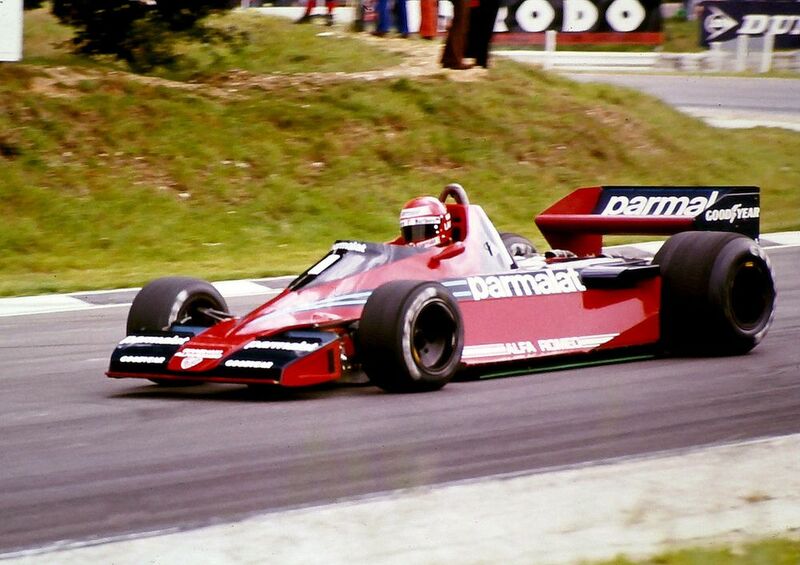 Unlike most of the field, the BT46 was powered by Alfa Romeo's 115-12 flat-12 engine. Compared to the ubiquitous Ford-Cosworth DFV V8 used by 90% of the paddock, the unit had a few advantages. It was very powerful, outclassing the DFV's with a figure of 520 horsepower at 12,000 rpm, some 50 more than the Cosworths could muster. Additionally the big brute delivered a virtual mountain of torque, producing some 439 nm (324 lb-ft). However, the bulky flat-12 also presented its unique set of problems. The flat layout provided a pleasing low center of gravity, but also made the engine incredibly wide. The venturi tunnels on Lotus’ 78 model ran through the car and ended just before the rear wheels. This space was free with the use of a Cosworth DFV V8, whose cylinder banks were at a pleasant 90 degree angle. In contrast, the Alfa’s cylinder heads were directly in the path of the proposed venturi tunnels, blocking the airflow completely and rendering them useless. To counter the problem Murray urged Alfa to develop a V12 to meet his needs, but designing a brand new engine would clearly take some considerable time. The cumbersome Alfa flat-12 didn't match with ground effect technology. Needing a quick bodge to stay with the big boys in the ongoing ground effect revolution, Murray looked to different solutions. While brainstorming he recalled the radical Chaparral 2J “Sucker Car”, which had shaken up the establishment in Can Am racing eight years prior. Rather than a complicated system of wing profiles and Venturi-tunnels, the 2J had gone for a more agricultural approach. It used two massive fans taken from a tank, which were powered separately by a 2-stroke snowmobile engine. With most of the car's underbody sealed off by lexan skirts, the fans were used to create a partial vacuum under the car, which forcibly sucked the car to the ground. The 2J ran into problems with the unreliable snowmobile engine and was banned before reaching its full potential. In Formula 1, such a system could still be made legal if handled the righ way, so Murray set about finding a way to incorporate the idea. The BT46B's schematics. Incoming air gets accelerated by the undertray (1). The sideskirts (2) contain the air under the car. Cool air is sucked in through the radiator (3). The air is sucked out by the fan (4). He came up with using a single large fan driven by the engine via a complicated clutch system. As the engine sped up, so would the fan. This meant higher the engine revved, the more suction the fan provided and the more downforce it produced. The feature gave Brabham a major advantage over traditional ground effect designs, as those cars only generated downforce at high speeds. 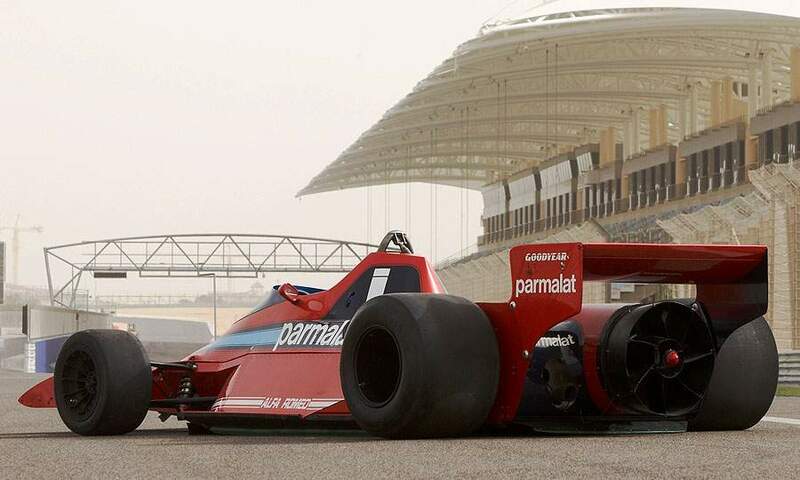 The Brabham on the other hand could produce downforce even at a standstill. Movable aerodynamic devices had in fact been banned by the FISA long ago, so Murray designed the fan to draw in cool air through a horizontally mounted radiator. As using a fan for engine cooling was perfectly legal, Murray claimed that this was the fan’s main purpose. The FISA stewards believed him, taking in account the Alfa's reputation for overheating. With the loophole in place, Murray got the green light from Brabham to finalize his design. The alien rear view of Brabham's innovative machine. Note the top-mounted radiator. Brabham’s engineers went to work applying the concept to the existing BT46 chassis. Unsurprisingly, extensive modifications were required to adapt the older car to the fan concept. In addition to the fitment of the fan and its clutch system, the body had to be modified to contain the low pressure area. This meant sealing off the engine bay, fitting rubber sideskirts and completely redesigning the car’s undertray. Brabham’s drivers were double (and reigning) World Champion Niki Lauda (AUT) and the experienced up and coming John Watson (GB). Despite his incredible talent and vast technical knowledge, Lauda took some time getting used to the car. Because the fan speed relied on the speed of the engine, he had to totally rethink his driving style through the corners. To keep the car planted to the ground he needed to accelerate through the corners, keeping engine and fan speed up. This exposed him to unusually high lateral g-forces, severely straining his body. Lauda did not like the concept very much as a result, feeling the car would leave him exhausted at the end of each race. Undeterred by Niki’s complaints, Brabham readied the cars for the Swedish Grand Prix at the airport circuit of Anderstorp. The track was famous for its long, fast, swooping banked turns. It provided a perfect hunting ground for the new BT46B. Realizing the enormous fan would surely arouse suspicion among their competitors, Brabham covered it up with a dustbin lid. But as soon as the cars started up, the fan's purpose was made all too clear. Every time Watson or Lauda went near the throttle, the car would squat down on its suspension from the increased downforce. Protests about the car’s legality followed immediately after. Lotus driver Mario Andretti complained the loudest, accusing the car of being highly dangerous. He claimed the fan picked up debris from the track and launched it out through the back at his car. Even though this claim proved to be untrue (the fan’s exit speed was not high enough to throw anything) the mood was set. Despite countless vehement protests, the car passed FISA technical inspections with flying colors and was allowed to race. Anderstorp's unique location took drivers right by an unguarded field full of aircraft. In qualifying Mario Andretti took pole in front of John Watson and Niki Lauda, who held back on special order from team boss Bernie Ecclestone. Clever as he was, Ecclestone knew Brabham's rivals would try anything to get the BT46B banned. As president of the Formula One Constructors Association, he had a difficult political position regarding the BT46B's amazing potential. From his perspective as a team owner the new machines terrifying speed was a godsend which would bring him a flurry of race wins, and possibly even the championship. From a FOCA point of view however, the BT46B was very dangerous. If the car could be as dominant as Gordon Murray was convinced it would be, it could severely compromise Ecclestone's position as president. With all these concerns raging through his mind, Ecclestone sat back and watched his cars rocket away to the first corner. Start of the 1978 Swedish Grand Prix. Niki Lauda immediately pounces on Mario Andretti. At the start Andretti managed to maintain his lead, with Lauda storming past team mate Watson to immediately give chase to the Italian-American. Watson's slow start resulted in him being passed by Riccardo Patrese (ITA) in his Arrows. The next lap local boy Ronnie Peterson (SWE) found also found a way past in the second Lotus. At the front of the pack Lauda and Andretti were busy fighting for the lead. Lauda forced Andretti into a mistake and passed him on the outside of one of Anderstorp’s tricky banked turns in a blatant demonstration of the BT46B's immense grip. Meanwhile, on lap 20, Watson spun out of 5th place due to a stuck throttle. Ronnie Peterson had passed Patrese, but was forced to back off because of a slow puncture. Lauda chasing down Andretti, Anderstorp 1978. A back-marker had leaked oil onto the track, which made life difficult for all cars except the Brabham. Seemingly unaffected by the greased-up slippery surface, Niki Lauda increased his lead further and further. Mario Andretti had to give up the chase on lap 46, as a broken valve destroyed his engine and his hopes for a good finish. Niki Lauda had promised Bernie Ecclestone to take it easy and downplay the car’s dominance, but evidently lost track of this instruction somewhere along the way. As he got more and more accustomed to the car, his lap times dropped further and further. In the end a bemused Lauda finished a gigantic 34 seconds ahead of Riccardo Patrese’s Arrows to take a crushing victory. Niki Lauda racing in solitude, Anderstorp 1978. After the demoralizing performance of Brabham's latest weapon, the rival teams had exploded with anger and resentment. Complaints and protests were filed left, right and center, with Lotus once again one of the most fanatic critics. At the same time, Colin Chapman's two-faced outfit immediately started design work on a fan version of their own 79 model. Because of Lauda's carelessness, Bernie Ecclestone now had to deal with the wrath of the remaining FOCA-teams. Still lacking any and all sense of self-awareness, Colin Chapman of Lotus headed a group of FOCA-teams threatening to withdraw their support for Ecclestone as president if he did not retire the BT46B. Bernie tried to negotiate his way out of it by proposing to drop the car after running three more races, which the other FOCA-teams accepted. However, the Commission Sportive Internationale of the FISA stepped in to spoil the party, declaring the car illegal after all for including movable aerodynamic devices. Niki Lauda lapping the 10th placed Carlos Reutemann's (ARG) Ferrari and the 11th placed Hans Joachim Stuck (GER) in his Shadow. With this decision, the BT46B was banned from racing indefinitely. In response Brabham begrudgingly retooled the cars back to their original BT46-spec, and continued racing without much success. Gordon Murray had been working hard on an improved twin fan car, which copied even more of the Chaparral 2J's design. This BT47 had now become obsolete, forcing him to scrap it entirely. The Brabham BT46B was brilliantly complicated way to get around a very simple problem. Brabham had come ill-equipped for the ground effect revolution with their useless Alfa Romeo flat-12 engine, and needed a quick fix while waiting for a V12. Using ideas almost a decade old, Gordon Murray cleverly gave the team the edge it needed by exploiting an unforeseen loophole in the regulations. Sadly the resulting machine was so incredibly good it disturbed the political fabric of the delicate world of formula One, leaving team principal Bernie Ecclestone completely cornered. Conflicts of interest and two-faced tactics from rival teams eventually brought an end to the exceptional car. As the dust settled Lotus continued where they left off, totally dominating the 1978 season and comfortably taking both championships. Even though they tried with all their might. Lotus never managed to truly beat the Brabham. Because the car was not illegal at the time of the Swedish Grand Prix, its commanding win was etched into the record books for all eternity. As the round at Anderstorp was the only race the car ever entered, the unique Brabham BT46B maintains a permanent 100% win rate, a feat no other car has been able to achieve since.